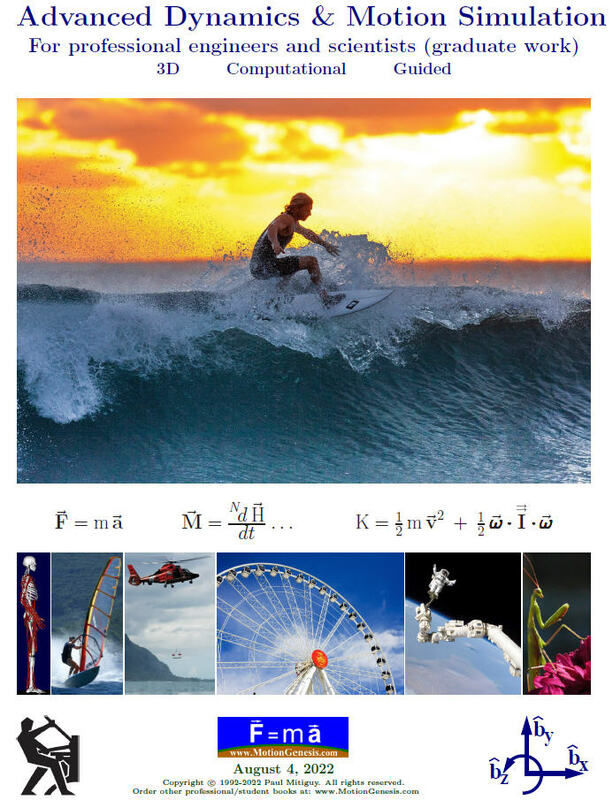 This book shows to form equations of motion for control system design, numerical simulation, vibration/structural analysis, optimization, and mechanism design. Theory: This training provides concise theory, examples, definitions, formulas, advanced methods, and tools for the efficient formulation and solution of equations of motion. Problems: The book contains 375+ interactive guided problems. Outcome: Ability to efficiently form and solve nonlinear differential and algebraic equations for constrained multibody systems with professional symbolic and numeric computational tools. Ability to use dynamics with controls tools (e.g., MATLAB®). Use: This dynamics material has trained engineering students at Stanford, Harvey Mudd, Lehigh, San Jose State, Tufts, Florida State FAMU/FSU, U.Florida, U.Nevada/Reno, U.Missouri/Kansas City, U.Texas/Austin, U.Illinois, Santa Clara, West Point USMA, York College, LeTourneau, Western New England University, Bucknell, Cal State Northridge, Temple University, Université de Sherbrooke, Rice University, U.Colorado/Denver, ... -- and many force and motion experts in government and industry. Interactive and guided. Example problems/homework are interactive and guided so readers continually make progress and steadily succeed. The meaningful problems synthesized via small intelligible steps reduces frustration, promotes confidence that dynamics is methodological (not a "bunch of tricks"), and provides a positive learning experience. Instruction is effective (useful skills and empowered engineers) and efficient (high-quality focused interaction). Total: 549 pages. Plastic wire binding, plastic front/back cover. Volume I: 314 pages. Theory, examples, appendices (4-color). Volume II: 235 pages. 375+ guided examples/homework problems (4-color instructor, grayscale students). Textbook description (page count, binding, etc.) is approximate and subject to change without notice. Student Edition: (ensure your instructor has already ordered this book or - CONTACT US). Instructor Edition: (instructors and professionals only - contact us). Discounted books/software may be provided to instructors after classroom adoption. charges may be added. Contact MotionGenesis.